Upon our arrival to Key West two months ago, we quickly discovered the popularity of the Spiny Lobster season. Particularly, the Mini Season at the end of July which is the most popular. The entire population of Key West is rumored to double over night for these two days as locals and out-of-towners try their hand at the first lobster diving of the summer. 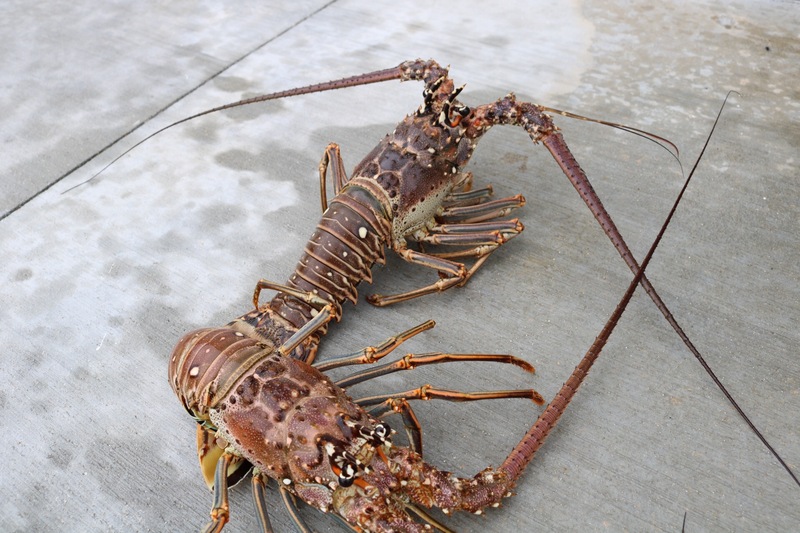 The spiny lobster, unlike their cold water cousins in New England, lack pinchers and are easier to catch by hand. All you really need to accomplish this feat is a net, tickling stick, snorkel, mask, fins, and a cooler/bucket. Taking some time to learn the lay of the land is also essential. They amount of boats on the water during these two days is unreal. I saw three boats diving in an area no larger than a baseball diamond. I am fortunate that my house is situated across the street from some private docks which we scouted the days before. Just like big game scouting, you want to get the patterns down and know where the lobster like to hide. We noted several ideal locations under specific docks and then a rocky jetty. Our plans were all laid out the night before the opener as we prepared our gear. Based on the local law, we could begin diving at sunrise. At approximately 4:30 am, I awoke to thunder, lightning, and buckets of rain being poured outside. This may not be the ideal opening day, but just like past hunting trips I knew I would wake up and endure the elements to obtain dinner. My alarm clock did not go off as normal. Instead, my wife, who was visibly more excited than I, shook me awake until I poured myself out of bed. Diving for lobster has been a bucket list item for her for several years, and while she would not get to directly participate in the diving, she was willing to monitor the bucket and measure the lobster. We also woke our 3 year old who was surprisingly excited about the lobster season as well. Their excitement quickly broke my morning haziness. I cracked the door to go outside and saw the extremely grey skies and what appeared to be rain all around us. I was determined to catch some lobster and was willing to get wet doing so. Lobster diving was a very new concept to me and all my education (about 15 minutes worth on YouTube) would come into play for the success of this adventure. After donning my fins and mask, I leaped into the water with an ungraceful splash. The bubbles settled and I took a look around. The rain, storms, and wind had made the water extremely murky in comparison to normal. I conducted a visual search under the first dock to locate a set of antennae sticking out of a hole under a rock. Buoyancy would be my biggest challenge here. The hole was just out of reach so I would have to dive down and try to maintain my depth with enough time to caress this lobster out of its comfy home and into my net. My first dive was unsuccessful. I floated upward quickly with the lobster just slightly perturbed. Time for attempt number two. Back down I went. I grabbed a nearby rock and held my position and my breath. I slid my tickler stick into the rocks and eased the lobster forward. Pew…. he shot out of the hole, past my net, and into a nearby crevasse. I returned to the surface ever frustrated. I eyed up another set of antennae and dove down determined not to repeat my mistake. You know what they say… third time is a charm. I dove back down, now to the other hole. I maintained my depth, caressed the lobster into my net and quickly rose to the surface with lobster in net! Pew… in another instant, the lobster exited the opening in my net…. what to do now? I did what any respected lobster diver would do and dove back down into the depths onto another pair of antennae. This lobster would be my golden ticket. Everything played out wonderfully and I led this lobster into the net and rose to the surface. I introduced a spinning motion to my hand that held the net. This seems to confuse the lobster and prevent it from escaping my grasp. I rose to the surface, handed my lobster laden net to my wife on the dock who used the trusty measuring tool to determine the size and legality of this particular lobster. Plunk… she tossed it back right over my head!!!! It was too small to keep. Luckily, I had honed my craft enough to return to the underside of the dock with success. This time, my trip to the surface was filled with my wife and daughter dancing to my success. There is nothing like hearing the cheering of your three year old daughter. That type of encouragement cannot be matched. She was as excited to catch them as I was, and even more excited to eat them later that day. I dove under a total of eight docks to catch my 6 lobster limit. Each dive provided its own unique challenges and mistakes. I even met some of my neighbors who were also out diving as well. I now understand how the excitement of lobster season fits into the local life in Key West. It relates directly to how I love to put food on the table. With the lobster diving, you get the opportunity to go out, have great experiences, learn from the wild, and meet people who share your passions all while obtaining food. I think the most interesting aspect of the entire experience is how closely lobster diving is related to hunting even though the act is very much fishing. As a lobster diver, you want to scout your terrain, understand the lobster’s movements, formulate a plan of approach, and move the animal into a position that will benefit your movement. The entire evolution is so very similar to hunting. Now… onto my second favorite part….. the eating!